Ah, laundry. I will miss this one day, right? 1. This too shall pass. I know that the weather and the crazy schedule will improve, and spring break is right around the corner. I hope to enjoy some nicer weather in Tampa along with a break from dirty diapers. Laundry and meal-prep follow me like a dark, bothersome cloud. Sorry, supposed to be positive - right! rather than putting a wig on her. There is a God. 3. With improved weather, I will be able to hop out of bed and go for a run before tots get dropped off. This saves time driving to the club and back. 4. The St. Pat's parties that Curly performs at are kind of a pain. Wigs and makeup for a few minutes? Have you seen Curly's real hair, and do you have any idea how hard it is to detach a wig from her noggin? BUT (yes, here comes the positive part), I do enjoy the opportunity to socialize with some of my other dance mom friends. 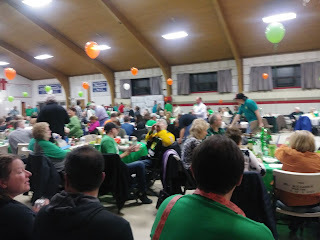 I even suggested to Coach that we invite some of our friends to a few of the shows (the ones that are not held in a church basement for a fish fry, but are at a real establishment) so we can sit and be real people with real social existences for one night. 5. There will always be teachers in need of childcare. The drama teacher at the kids' high school told Mini the other day (when he was trying to convince her to join speech team because he has heard that she is very funny and animated -she was flattered but still plans to play basketball next school year which is smack in the middle of speech season) that he has heard good things about me and might need me full time next school year for his 2 year old. It will all work out. Hey, teachers - bring me your sweet, cute babes. 6. There are bound to be some relaxing weekends in the future. Once summer hits, I will inevitably find myself camped out on a lounge chair at our local pool soaking up the sun and free time. Patience is what I need here. 7. We have a new water heater. Well, there's something to be excited about. We won't have to replace the water heater for many, many years. Woo-hoo. I am banking on the little things like this to get me thru the dull-drums. 8. The kitchen hood situation - now that is a whole other ball of depressing wax! I can't be positive here - just can't do it. I am here to tell you, you WILL NOT miss the laundry. As an expert in this field, I believe you. I do not have a problem doing the laundry. 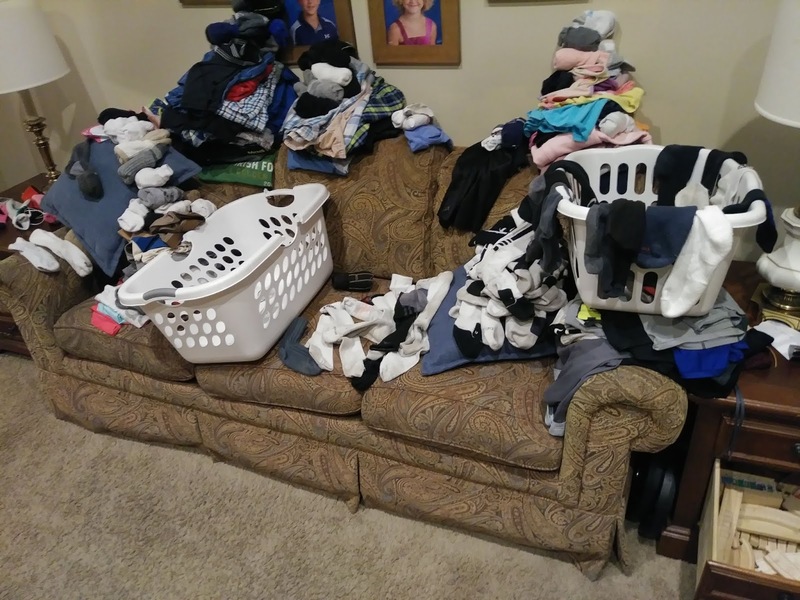 Sorting, folding, and insisting that the wearers of the clothes put theirs away. . . drives me INSANE! I really don't think you will miss the laundry. The kids yes, the laundry NO!!! And I'm not sure I could clean snot rockets out of other people's kids. I am about to throw up just looking at that picture. 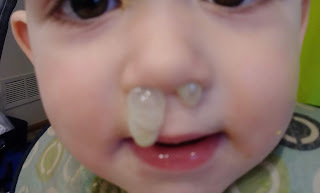 It's one thing when it's your own little one's snot but when it's not....just not sure I could handle it. We have had way more sun than rain around here this week and that alone has lifted my spirits. Hoping you can continue to find the small positives in your daily routine! The thick, flowing noses that show up at my house all winter are the bane of my existence. Of course everyone in my family gets some form of it. Not sure I get paid enough for that. I want to tell the parents to keep them home till it is better, but it is not realistic to expect them to take a week off while they sit home and wipe that gross nose. I am in Tampa for spring break. Three days of i0 degree weather in a row so far. Ahhhh!!! Just what I needed.